After my rant the other day about how I didn’t think much of Berlin’s big ‘set piece’ post-wall architectural planning, I thought I’d try for something a bit more positive. It’s occurred to me that a lot of the stuff that I really like is in the city’s neighbourhoods, and generally smaller residential projects. The sun made a special guest appearance a few days ago (Berliners stared at it for a while, confused, then continued with their lives) so I took the opportunity to take a few snaps of what’s within a few hundred metres of me, here in Kreuzberg. Other than the first two, I wouldn’t describe many of these buildings as ‘great’ architecture, just surprisingly good buildings considering that they don’t ‘need’ to be; there are no grand gestures making statements about a reunited Germany, nothing done with postcards in mind. In Britain, there would be much less chance of this kind of thig being done well. On the opposite corner next to us on the canalside is HH Müller’s Abspannwerk, a huge dark brick building which doesn’t look much at a glance, but is all in the detail. Built in 1924-26 as an electrical transformer station, it’s one of two still surviving which Müller designed; confusingly, part of the building is now occupied by an upmarket restaurant which takes his name. A few hundred metres further down the canal, but six decades later, is a whole terrace of buildings on Fraenkelufer, built for the 1987 IBA (International Bauausstellung). Thinking had moved on from the Hansa quarter of the ’57 Interbau (see previous blog on this) – the new blocks are carefully inserted between retained facades of 19th century apartments, with a large landscaped courtyard behind. It’s all unfashionably postmodern – hardline modernists shouldn’t scroll any further – you won’t like it. But at the same time it’s quite genuine architecture. The wonky columns really are supporting the buildings, and it’s a patchwork, quirky development that I can imagine living in. I’ve read, but not sure if geographically precisely true, that this particular site had already been cleared for a proposed motorway route in the 1970s. The motorway was never built, which was just as well, as it is unclear to me why the hermetically sealed island of West Berlin (as it was at the time) needed a huge orbital motorway at all. Maybe it was so west Germans could drive round and round next to the Wall in their new cars, to create some Ossi envy. For the record, it’s by Hinrich and Inken Baller, 1982-84, as part of the IBA exhibition that culminated in 1987. Not sure who designed the next few, and of various styles (and qualities), but the point perhaps is their proximity in such a small locality. Finally, and you probably won’t like this, a huge concrete hospital which overlooks a quite pretty stretch of the canal at a point where it widens, with grassy banks and pleasure boats. Not a beautiful building perhaps, but the detailed design is very thorough. For some reason it feels Canadian to me – the sort of building featured in early Cronenberg movies, and evoked by Boards of Canada. You’ll have to take my word for this. Note the Rogers-like vent pipes – about the only detail which breaks from the austere concrete. ‘Critical Reconstruction’. A term used to describe the policy for rebuilding post-wall Berlin. The vast areas of waste ground left by the wall zones were to be infilled, by reverting to older street patterns, and by following a set of conservative building codes which limited the height, and (in places) the style of new buildings. 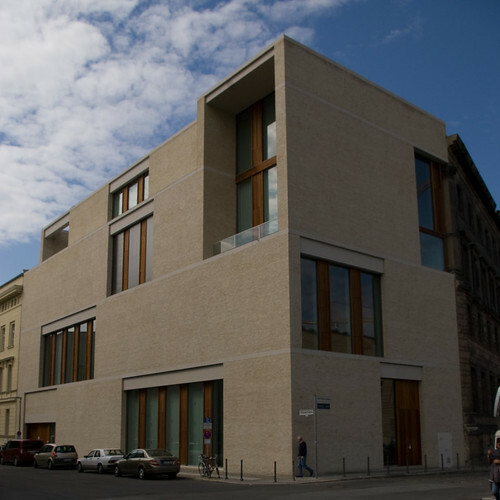 In Pariser Platz, next to the Brandenburg Gate, the building rules seem to have been at their most restrictive, with every new building complying with the required style of horizontal stone banding. Frank Gehry’s Deutsche Bank HQ has had to hide his signature shiny-curvy building behind a singularly uninteresting façade. The rebuilt Hotel Adlon is just an overscaled version of the original, and the recently-completed American Embassy, which has the prime spot overlooking the Tiergarten and the Holocaust Memorial, sets new standards for blandness. The only building that subverts the rules slightly is Michael Wilford’s British Embassy (not saying this just cos I’m a Brit) – angular structures in purple and blue appear to explode from a ‘missing’ section of the plain stone façade. The vast new buildings of Potsdamer Platz, designed by a string of ‘big name’ architects, are curiously underwhelming; the whole layout of the site was something of a compromise with the major site owners (I’ll save a rant about that for another day). But the greatest loss of nerve is the Reichstag. “Surely” you’re thinking, “this is a triumphant rebirth of Germany’s parliament building in an assured high tech intervention by Norman Foster?” Or words to that effect. It’s still one of his best works, with his signature ‘techno bits inserted in an old building’ look, done well. But it could have been something altogether more radical. Post-blog note, Aug 2017, only 9 years late! Have just found a snap of the model, how cool! The competition to transform the Reichstag into a new parliament building had three joint winners: Norman Foster, Santiago Calatrava and Pi de Bruijn. But all three were subsequently asked to start over based on a much reduced brief, essentially requiring less floor space, contained entirely within the existing structure. Foster won this ‘second’ competition with the design which was carried through – including the familiar spiral ramps inside a glass dome. 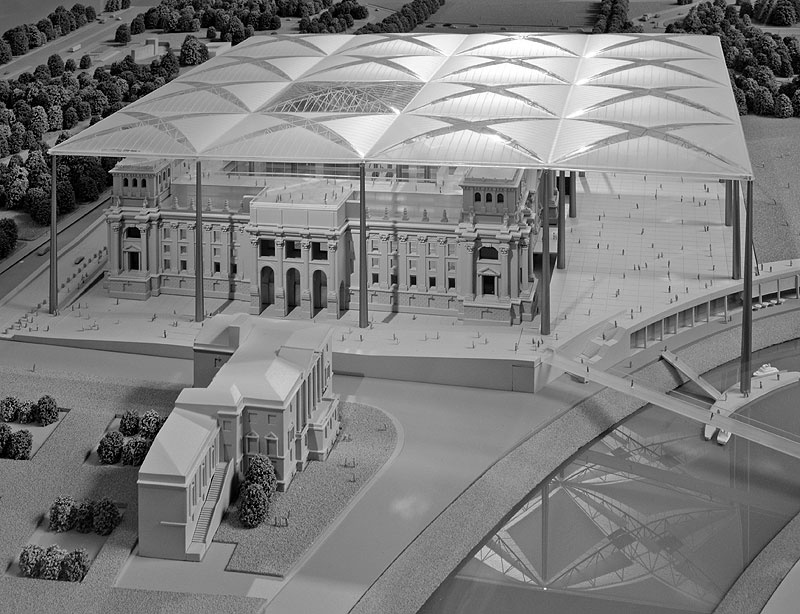 But his original design proposed a colossal independent roof structure, enclosing not only the Reichstag but a large space around it, even spanning across part of the river Spree. 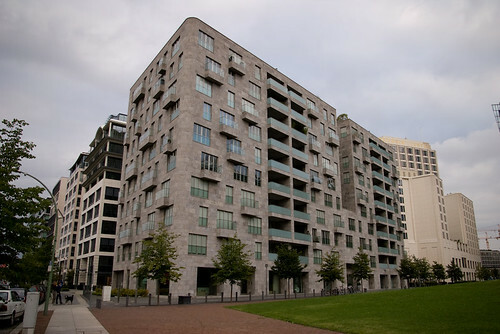 A raised podium would have covered the same area, cutting off the lower parts of the original building’s façades. The Reichstag would thus have been only a part, albeit the key element, of a larger whole; a literal representation that the new parliament would stand as something which accepted and incorporated the nation’s past, but at the same time would be something new and open. It was a strong idea, particularly as the original 19th century building is considered by many to be a bit of a dog’s dinner. It was a not entirely successful attempt to merge a number of disparate styles, and couldn’t better represent the dead end that neoclassicism had reached in the years preceding the birth of modernism. Even its architect, Paul Wallot, admitted that he struggled with an ‘impossible’ task. There was also the fact that the building was not in its original ‘intact’ state: it had been burned out in the 1930s, shelled by the Russians, and already refurbished in the 1960s. So as architecture, it didn’t really bear comparison with the government seats of some other nations – Barry and Pugin’s Palace of Westminster, for instance. But in the end, conservatism prevailed, the competition requirements were rewritten to ensure that the building wasn’t radically changed. So that’s what’s now on the postcards.